For the last couple of years, I’ve been developing a new product line called MULTIPLANES that I sell through VINYLSMACK; my side excursion. Originally most product I sold through VINYLSMACK were vinyl decals. I eventually started moving to paper made die-cut products like the set of Back to The Future Deloreans (pictured left). After exploring the possibility of mixing different materials on one product, I reached back to an old product idea I had created about 10 years ago that featured multilayer art that was spread across multiple frames just like they did with the early animation with the Multiplane cameras. My early attempts failed because I was using clear transparency sheets to layer the art. After a few layers, the art would get murky/cloudy and wasn’t clean so I eventually ditched the idea. Fast forward to 2016, I brought the idea back to life after I invested in a laser cutting machine. 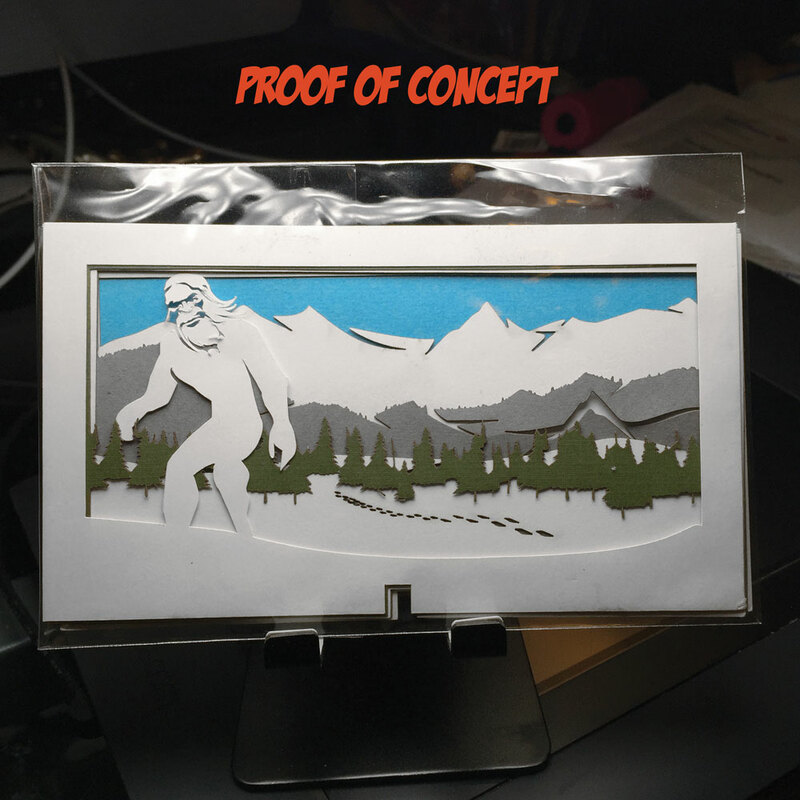 After the first proof of concept (shown above) and several prototypes, I was able to bring my original vision to life by creating three dimensional scenes out of paper, wood, acrylic, and full color printed elements (shown below). I also created a system where multiple frames quickly get inserted into a slotted base which makes setting up the product easy. It also let’s the user take part in “building” the product. Part of the fun is seeing a three dimensional scene come to life. Series 1. For the first release of the product, I wanted to have 5 products to choose from that were all related in some way. I ended up choosing the Paranormal/Cryptozoology genre for Series 1. I love the genre and tales that come from them. I often listen to podcasts like Mysteryous Universe, Expanded Perspectives, and The Gralien Report which not only feature these type of stories but present them in an engaging way. I love the creepy tales about the Men in Black, Yeti, and Kraken so I started off with those. I also brought in my brother to work on the UFO scene called “TAKEN.” I also created a fictional character called the Oddity which features a “freak show” type of character that sits in a traveling carriage that gets hauled by a flying bird. For that one, I just let my imagination run wild. The goal for every MULTIPLANE early in the development and going forward is for there to be this feeling like your looking into a scene that is unfolding. I wanted them to feel very alive and packed with motion, emotion, drama, intensity, and life. Every MULTIPLANE also has a central character or object that pulls viewer in visually. You really have to see one of them in person to appreciate the depth and level of detail that each one has. I also designed them to be perfect for keeping on your desk or a shelf so they don’t take up too much space. MULTIPLANES Series 1, World of Mystery,” has been out for over a year now and I’m now starting to design a 2nd series that explores the lofty heights that transportation reached before the modern era. From electric trains that sprawled early Los Angeles, to taking command of the skies, Series 2 showcases mankind’s vision for the future of transportation.